This is the 90-Degree Crossing Steel Power-Loc(TM) Model Train Track HO Scale From Life-Like Trains. Retail $9.98 SAVE 24% ! Steel rails and black molded roadbed. The superior side locking track system snaps together easily, and ensures the smoothest connection possible. Superior construction and design! 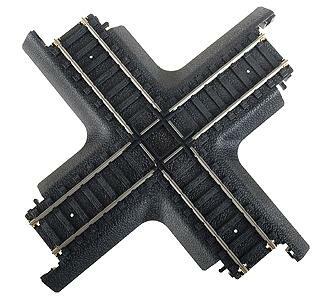 Rail joiner track can be converted to a Power-Loc layout by using the Power-Link Adapter Track (not included).